Chris Evans suits up to smash the bad guys in Captain America: The First Avenger. The high-spirited action-adventure superhero movie Captain America: The First Avenger highlights a costumed hero who emerged from the early days of the Marvel Comics universe to proudly take his place among such contemporary Marvel good guys as Spider-Man and the X-Men. In the film, the Captain America’s humble beginning comes in the form of Steve Rogers (Chris Evans, The Losers), a skinny little guy who volunteers to participate in an experimental program that pumps him full of strength, transforming him into the World War II-era super soldier. 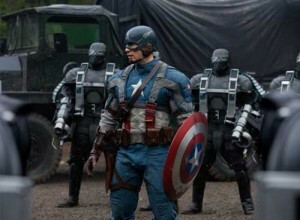 Equipped with a super-duper stars-and-stripes shield, Captain America teams up with military operatives Chester Phillips (Tommy Lee Jones, The Company Men), Bucky Barnes (Sebastian Stan, Black Swan), and Peggy Carter (Hayley Atwell, TV’s The Pillars of the Earth) to fight the evil organization HYDRA, led by the villainous Red Skull (Hugo Weaving, The Wolfman). Captain America is one of a continuing slate of films being produced by Marvel Studios based on its comic book line of do-gooders. It’s titular hero will next been seen in the anxiously awaited Marvel Comics superhero extravaganza The Avengers, which is coming to theaters on May 4, 2012. Received positively by critics, Captain America rang up $175 million at the domestic box office, putting it on par with its Marvel Comics brethren that also appeared in smashes during the summer of 2011: Thor (which grossed $181 million) and X-Men: First Class ($146 million).